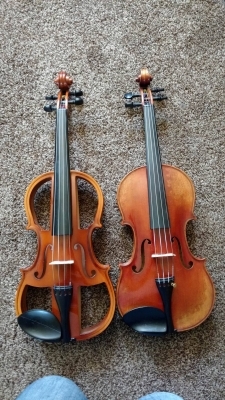 The difference between a normal violin and a cut out violin and practicing/progressing. So some of you may remember from ages ago that I have a unique violin that is cutout. (affectionately known now as "snippet") and I have a GCV Bourree (Aka Viero). As I've re-started my learning program I have found that the loudness and possibly the resonance of the Bourree almost makes it harder for me to concentrate on what i'm learning. I've started to go back to my old violin an i seem to have an easier time practicing and learning on it. Do you think it's possibly because i get distracted by the loudness? lol. I also find when I'm relaxed and playing around i naturally hit better notes regardless of the violin i'm playing on (like in the audio attached) but when i'm learning a piece, such as I am right now (green sleeves) I can't seem to hit the right bloody notes lol. I switch to snippet at bam much easier. Maybe it's because i learned a great deal on it and it's like greeting an old friend. Has anyone else had issues with resonance or loudness of the violin hampering them while they are learning? how did you deal with it? Since I just play for myself or a few friends should i think about getting or trading for one that is a tad less loud? I may just be readjusting to a 'normal' violin lol. the Bourree sounds great recorded it's just under my ear thats the issue i think lol. oh learning problems....why did i take such a long break?!!!! Oh And before anyone recommends it yes I do use the earplugs FM sells to help sometimes with Viero and it does seem to help a bit. The audio is the normal GCV Bourree first and then snippet open strings then playing around. I think you are right. You are bothered by strong sounds. You should definitely purchase a practice mute if you don't have one. Obviously you can practice on your "snippet" violin but the quality isn't as nice and rewarding. I too can get terribly annoyed when an instrument is too loud. At that point I need to either sleep, rest, or use hearing protection, which is also a great solution. hahah you know something rather funny. I think I found my issue and it's kinda silly. I found if I play standing the loudness doesn't bother me, but lately I had taken to sitting cross-legged or kneeling on the floor and somehow the combination of sitting near the chair and couch that I had picked seemed to amplify the loudness of my violin. I practiced standing infront of my music stand and Ta da...problem not an issue yesterday . *sigh* well at least it was an easy fix hahaha. and im glad I don't have to continue using ear plugs or a mute as I have always loved the sound of my violin or contemplate buying another violin, until I want to upgrade. Yeah - playing outside can be great fun - first step to busking ! Ha ! You can test it by finding a room that's very sound reflective. Tile walls would be ideal. If playing in there drives you nuts, and getting close to one wall really drives you nuts, that would almost guarantee that echoing was what the problem was. Outside, the reflective surfaces are far away and not very effective. Just being further away from the reflections in the room made it enough better that it was no longer a major issue inside. I'd bet if you put rugs, drapes, etc in the room you're practicing in, it'd get even better. I'm glad you found the problem, because that Bourree sure sounds good. @Uzi I know right! The bourree is my favorite violin to play and when I get my notes right and just let the music flow it just takes my mind away and off of everything going on. I can say it has hands down been one of the best investments I could have ever made. I'm so glad FM picked this one out for me! I trusted him on a whim after I narrowed down which violin I wanted in the price range I could afford and he was fantastic in picking the perfect one for me. Sounds great. Thanks so much for the update.